Dashboard widgets show an overview of your UCM CRM system. See past weekly earnings and expenses in a graph and receive notifications when jobs are due or customers upload new files. A great fluid responsive layout to accommodate various screen sizes. Menu will shrink out of the way on small screens. Very smooth and fast operation on mobile devices. Plus it looks great! Note: This is a theme for the Ultimate Client Manager CRM. 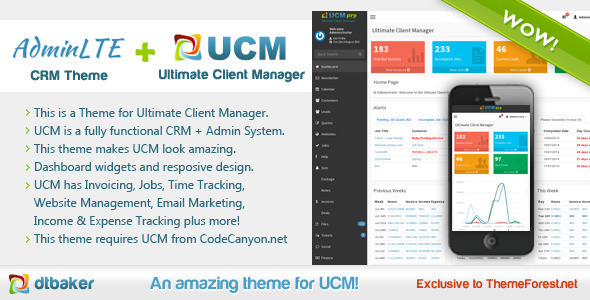 Please ensure the latest version of Ultimate Client Manager (Lite or Pro) has been purchased and installed before using this theme.